The Earthquake “SWS” - Shallow Woofer System- Provides more sound from less space with less power than any other woofer technology. The core technology of the SWS was pioneered by Earthquake Sound's President Joseph Sahyoun and is now protected by multiple global patents. the motor to be elevated. This reduces the mounting depth of the speaker while enhancing excursion capability. More excursion (woofer movement) equals more sound. 1. Direct factory drop-in replacement. 2. Greatly enhanced sound quality. Enjoy a rich full bodied sound with articulation and dynamics rivaling home hifi audiophile systems. 3. Plays louder and cleaner than standard woofer - using less power. 4. Works perfectly with factory amplifier, while still capable of further SPL with upgraded amplifiers. elevates the expectations for the audio system as people now carry their music with them where ever they go - making comparisons easy. They want it to sound as good as it possibly can while being on the road. Preferably it should be so good in the car that the driver looks forward to both the ride and the music. With Earthquake SWS woofers the authentic and authoritative sound is always at the driver fingertips. “SWS” technology employs a patented ribbed cone that eliminates cone break-up distortion while maintaining a light moving mass. This keeps the woofer nimble, fast and accurate. This fast acoustic response makes the sound engaging and entices the listener to turn up the sound as it just sounds “finger snapping good”. “SWS” employs a revolutionary innovation that welds an aluminum voice coil to an aluminum dust cap thus turning it into a heat sink. This heat exchanger uses convection/ conduction to transfer the heat out of the box. This increases the woofer performances and ensures that heat derived compression never occurs. The “SWS” will play louder and more accurate while using less power and taking up less space than any other woofer on the planet. Our most popular size is the SWS-8” as it is a direct drop-in BMW factory replacement for the woofers located under the front seats. Simply remove the seats and replace the factory woofers with the SWS-8 woofers to improve the sound quality. 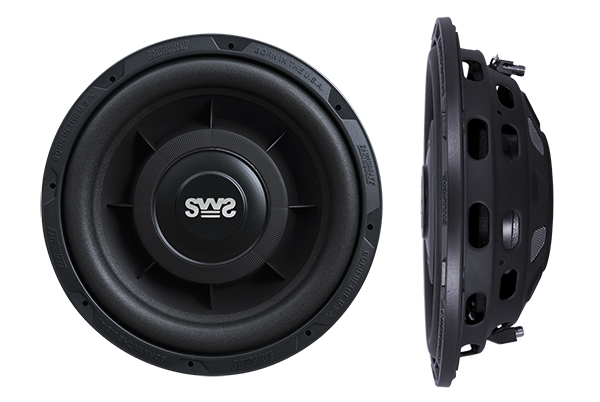 Earthquake Sound also produces the SWS-8Xi that has a 2Ω voice coil - the same impedance as the BMW factory speakers.